A first year undergraduate student once came to see me during an office hour and posed a question involving thiophene. Some aromatic substitution, I think. He drew a molecule on the board. Those of you who teach organic chemistry might know the feeling… I looked at the structure and almost got upset by how unappealing it looked. For instance, the C-S-C angle was ridiculously close to 90 degrees. Of course, it takes time to know how to draw things well in chemistry and we all have been there. So I tried to encourage my visitor by saying: “You might want to take into account some geometrical considerations when you draw 5-membered rings. Your structure is somewhat unrealistic – where is the 120 degree C-S-C angle?”. Unbeknownst to him, the student was correct and should have jabbed me by saying: “Why don’t you learn your inorganic chemistry and know your bond lengths!”. Perhaps I need to know the chemistry of main group elements a bit better when I draw them in my structures. I think that from now I might make it a point to draw an angle that is close to 90 degrees in my thiophene structures. Will I actually do it? Who knows, probably not. 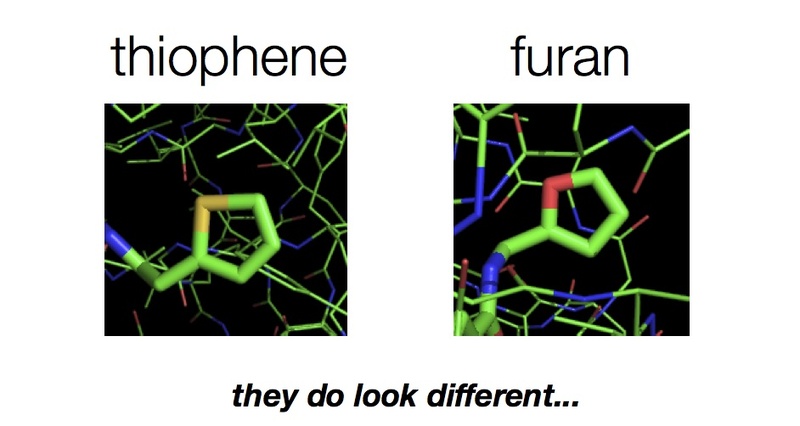 But I do think that our tools of rendering molecules are adequate, yet not perfect. A lot of important features are “lost in translation”, so to speak.